Of medium height, clean in outline, elegant in appearance and movement. Very active with a keen game sense. Intensely friendly and good natured. Head carried high, long and reasonably lean, with well defined stop. Skull oval from ear to ear, showing plenty of brain room, a well-defined occipital protuberance. Muzzle moderately deep and fairly square, from stop to point of nose should equal length of skull from occiput to eyes, nostrils wide and jaws of nearly equal length, flews not too pendulous; colour of nose black or liver, according to colour of coat. Bright, mild and expressive. Colour ranging between hazel and dark brown, the darker the better. In liver beltons only, a lighter eye acceptable. Eyes oval and not protruding. Moderate length, set on low, and hanging in neat folds close to cheek, tip velvety, upper part clothed in fine silky hair. Jaws strong, with a perfect, regular and complete scissor bite, i.e. Upper teeth closely overlapping lower teeth and set square to the jaws. Full dentition desirable. Rather long, muscular and lean, slightly arched at crest, and clean cut where it joins head, towards shoulder larger and very muscular never throaty nor pendulous below throat, but elegant in appearance. Shoulders well set back or oblique, chest deep in brisket, very good depth and width between shoulder blades, forearms straight and very muscular with rounded bone, elbows well let down close to body, pasterns short, strong, round and straight. Moderate length, back short and level with good round widely-sprung ribs and deep in back ribs, i.e. Well ribbed up. Loins wide, slightly arched, strong and muscular, legs well muscled including second thigh, stifles well bent and thighs long from hip to hock, hock inclining neither in nor out and well let down. Well padded, tight, with close well arched toes protected by hair between them. Set almost in line with back, medium length, not reaching below hock, neither curly nor ropy, slightly curved or scimitar-shaped but with no tendency to turn upwards: flag or feathers hanging in long pendant flakes. Feather commencing slightly below the root, and increasing in length towards middle, then gradually tapering towards end, hair long bright, soft and silky wavy but not curly. Lively and slashing in movement and carried in a plane not higher than level of back. Free and graceful action, suggesting speed and endurance. Free movement of the hock showing powerful drive from hindquarters. Viewed from rear, hip, stifle and hock joints in line. Head naturally high. 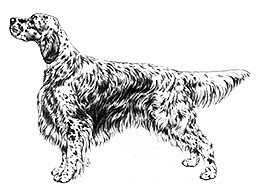 From back of head in line with ears slightly wavy, not curly, long and silky as is coat generally, breeches and forelegs nearly down to feet well feathered. Black and white (blue belton), orange and white (orange belton), lemon and white (lemon belton), liver and white (liver belton) or tricolour, that is blue belton and tan or liver belton and tan, those without heavy patches of colour on body but flecked (belton) all over preferred.